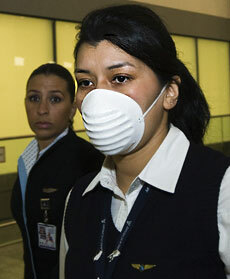 Costa Rica has confirmed two cases of Swine Flu. The infected parties are a 21 year old woman and a 29 year old man, both returned recently from trips to Mexico. Costa Rica receives daily flights from Mexico. The woman traveled with 92 others on her flight home. Both persons were treated at Calderon Guardia Hospital. Incredibly, the infected woman decided to ignore health officials and broke quarantine so she could attend classes at her university. Thirty-five others are under watch. A third person, a youngster, has flu symptoms (not yet confirmed as Swine Flu) possible infected by her father who recently returned to Costa Rica from Mexico. If confirmed, that would be the first case of swine flu caught within the borders. The Ministry of Health this morning asked the passengers of two other flights, TACA LR 631 and Mexicana 387, to call 911 emergency so they may be tested. Employees at the San Jose airport are wearing surgical masks, and many incoming passengers are having their temperatures taken upon arrival. I am not going to go into this swine flu deal because unless my readers are living on another planet, you have been deluged with probably more information that you want to know. I am more concerned though as my wife works at Calderon Guardia Hospital.